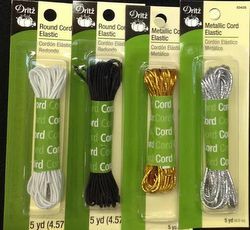 1/16" light weight cord elastic. Use this for button-loops, baby clothes, doll clothes or other craft purposes. Machine washable and dryable. 40%polyester, 60% rubber. Sold in 5 yard pieces. .